Street Theatre: Superheroes or supervillans? See below for a post from Linda Delgado calling upon the Joint Select Committee on Deficit Reduction to protect poverty-focused development assistance. Linda Delgado is Director of Government Affairs at Oxfam America. It is street theatre everywhere these days. Standard decision making processes and procedures are OUT. Legislating on appropriations bills is IN. And twelve Joint Select Committee Members of Congress have the unprecedented power and burden of making non-amendable recommendations to Congress about how to reduce our deficit by at least $1.2 trillion over the next 10 years. On this beautiful, crisp Fall morning, as Super Committee members gathered for their third public meeting, Oxfam America did a little “street theater” of our own in front of the US Capitol. In the name of our 1.3 million constituents, we donned superhero outfits, capes, and masks representing each member of the Joint Select Committee. 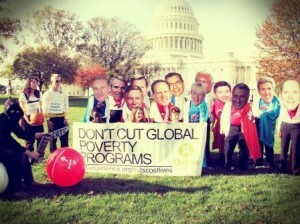 Our message: oppose cuts to poverty-focused foreign assistance. Oxfam calls on members of the Super Committee to avoid cutting poverty-foucsed foreign assistance. Photo by Matthew Hale/Oxfam America. The members of the Super Committee have much bigger fish to fry as they struggle with large domestic spending priorities that are vital in these tough economic times-but we need them to understand the enormous, disproportionate, life and death impacts of potential cuts to foreign assistance (less than 1% of the budget), specifically poverty-focused assistance, which is just 0.6% of the budget. Poverty-focused foreign assistance is one of those tiny budget issues where a small gesture by the Super Committee (no cuts) will turn our 12 potential villains into life-saving superheroes. Whether they care because it is the right thing to do; because they get the U.S. trade and job creation potential; and/or because they understand what former Defense Secretary Robert Gates and many other military leaders have said about how basic assistance to reduce hunger and poverty is a critical component of our national security strategy-we call on them to focus for a moment and agree to protect poverty-focused foreign assistance from cuts.